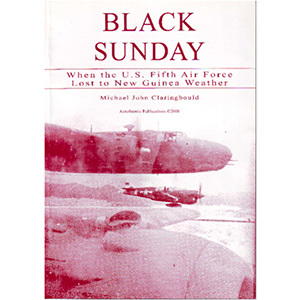 Sunday 16th April 1944 marked the biggest loss to weather in the history of the United States Army Air Force. After a delayed morning departure more than three hundred Fifth Air Force aircraft departed forward New Guinea bases to attack Japanese airfields and installations at Hollandia, Dutch New Guinea. Not one aircraft was lost to enemy action. While the crews carried out their mission, a massive frontal system blocked off their safe return home. That afternoon no part of New Guinea’s sky was still, every loss directly attributable to natural forces which dominated all outcomes. Dirty weather scored a clean kill over thirty-seven of the returning aircraft, making mockery of the carefully planned strike. Recounting chronologically the day’s events is impossible due to the resultant chaos in relation to time and movement. Survivors and victims were treated ruthlessly and unexpectedly. Despite so many participants, both airborne and on the ground, those present had but limited view of the overall picture. The intensity of each personal experience meant that each individual perspective was narrow. However this book presents a combined compilation of the day’s rich history, revealing a fast-moving and unstoppable tragedy in which luck played a leading role. It is less complicated to write of success an enemy routed and a plan fulfilled. Black Sunday was not such an event. The day and its aftermath epitomize the type of war for survival which the Fifth came to know so well. The day and its consequences are deserved of being finally put on the record after having been lost to history for more than seven decades.